on the woodside. : *all in a day. Friday, January 23, 2009 Labels: cookery. 5:00 a.m. Alarm goes off. 7:00 a.m. Second alarm goes off. 7:09 a.m. Third alarm goes off. 7:18 a.m. Fourth alarm goes off. 7:27 a.m. Fifth alarm goes off. 7:36 a.m. Sixth alarm goes off. 7:45 a.m. Seventh alarm goes off. 8:19 a.m. Breakfast in one hand. Diet Mtn. Dew, two sets of keys (house and World's Largest Rental Car), and handbag in other. Wearing something that passes, through heavy lids, vaguely as clothing. Not even a half-hearted attempt at a made-up face. It's possible there's only mascara on one eye, but it's hard to tell because of the difficulty differentiating today's from yesterday's. Lunch clenched firmly between teeth, a wrench of the ankle trying to cross the roots-bestudded yard in heels, and I'm off. 8:39 a.m. to 6:48 p.m. Workity. Workity workity work. Work work work. Inhale something completely forgettable for lunch. Work some more. 7:15 p.m. Change clothes and take the dog for a run. Hit up the Publix for its last bag of basil (previous grocery trips—to two separate stores—were fruitless endeavors). 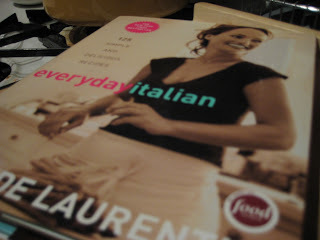 Then head home to crack open the Everyday Italian. I KNOW, RIGHT? Who is this person? She sweats (on purpose), she spends money, she embarks on appropriately industrious evening activities that do not involve Bea, Rue, Betty, and Estelle. Were it not for my old friends festering dishes and fetid laundry, I would not know myself. Although, to be fair, I had help. 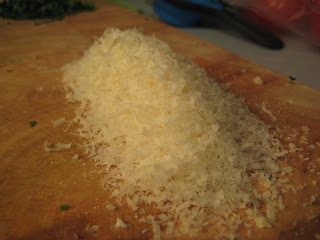 To begin: Microplaned fresh Parmigiano. It's soothing, the effortlessness it requires to make that downy pile. Luckily the rest of the wedge will live for a while in the one clean corner of my cheese drawer—that's a $13 dairy investment I will not soon forget. 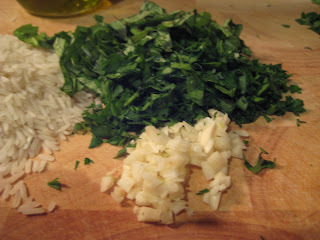 Next: Chopped fresh parsley, chiffonade of basil, and garlic (note: I always double the amount of garlic called for in any recipe. I think Alabama cloves are puny). Then: A mountain of pebbly Arborio. 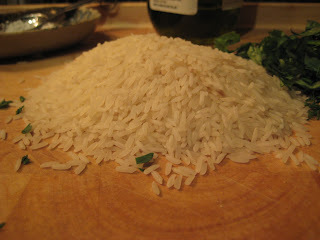 I had the rice on the Woodside, which made me feel like someone who could pass as capable. I don't have a pantry and I live like a slob, so having ingredients on hand is a rare and pleasant event. And now, let us pause for reflection. That's the handsomest thing to grace my kitchen since Coppertone. 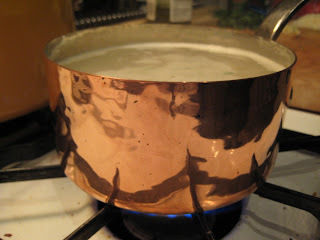 It's part of a set of five pretty pretty copper pots that TFin and JB bought me for Christmas. They're supposed to weather to a jaded, bitter finish with use, but for now I appreciate their spit-shine naivete. There's rice in there boiling away, which, once cooked, is rinsed and mixed with the chopped herbs, garlic, salt and pepper, a splash of olive oil, and the Parmigiano. That mixture gets spooned into hollowed tomatoes and placed in an oiled baking dish. Le Creuset. SPOILED ROTTEN, I am. The Food Network lists the difficulty of this recipe as "Intermediate." Why? 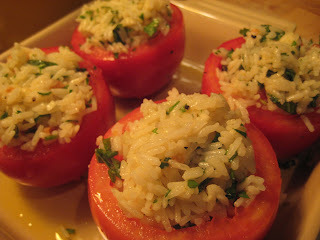 The rice cooks for 10 minutes, you mix it with a few other things, and you stuff it in a tomato. What's difficult about that? They are meant to be eaten either hot or at room temperature, which made them perfect for the next three day's lunches (packed in Snapware!). If I had it to do over, I'd mix half of the cheese into the rice mixture and sprinkle the rest over the top, for a golden crust. 10:00 p.m. Curl up on the sofa for my nightly three-hour Lifetime sitcom marathon. Discover "Will & Grace" episodes I've already seen are being preempted for some horrible baby-snatching/wedding disaster/only hot vain dudes can help sad fat women see their true hideousness nightmare. 10:03 p.m. Eat M&Ms. Not a hot vain dude in sight. C'est la vie. Cheers to . . .
Congratulations and hugs and loe from Dad. 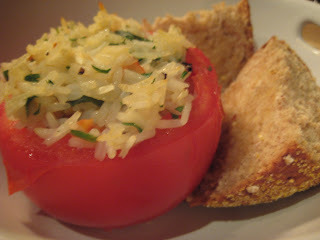 God, I LOVE stuffed tomatoes. Couscous is really good in there too. Congratulations for a year! Write more often. And make the tomatoes at my house!